This is the adjustable version of our revolutionary new doorstop. 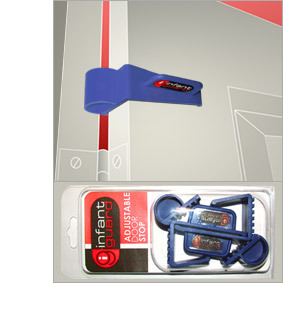 The Infantguard adjustable door stop has the advantage of alteration for larger hinge sizes to keep a door in the fully open position. It's unique fitting position above the top hinge of an internal door prevents the door closing far enough to trap little fingers - regardless of the hinge size. What's more, unlike other products on the market, this device protects BOTH sides of the door.